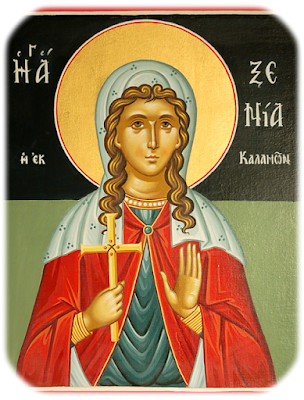 Below is an account about St. Xenia, whose feast day is celebrated today, written by Fr. George Poulos in his second volume of Orthodox Saints. The Greek Orthodox Church of the Annunciation at 302 West 91st Street in Manhattan is where St. Xenia first revealed herself after centuries of anonymity. When I traveled to Greece in 1992 I had the opportunity to visit the birthplace of my mother in Kalamata with my sister. We traveled to a female monastery near the Cathedral of the Ypapanti where the nuns are famous for their silk-work. To my surprise I noticed that there were icons of St. Xenia everywhere, reminding me that this city was the place of her martyrdom. I never found out if there is actually a church or chapel dedicated to St. Xenia in Kalamata, though I later found out that a chapel was built in her honor a year later in 1993. Why Xenia remained screened from Greek Orthodoxy for so long a time is attributed to the will of God, the same will that selected a comparatively obscure twentieth-century priest as the herald of the unacknowledged saint. The amazing disclosure would have been more plausible had some archaeologist unearthed St. Xenia's earthly remains, but that was not the choice of the Lord whose acts often puzzle the will of man, but whose truth is borne out in one way or another. The comparative simplicity of the occurrence merely dramatizes the way of heaven and the truth of Jesus Christ. In yet another incredible incident, Father Nasis acquired laurels which he never wished for and which he thereafter chose to minimize rather than exploit. In one of his customary periods of meditation and prayer there appeared before him a very lovely girl who announced herself as Xenia, a martyred saint of the Church. Not only did she reveal herself for the first time in 1700 years, but she bade the good priest to paint her likeness, asking that in the icon her hands appear clasping a Cross. The icon of St. Xenia still adorns the Annunciation Church and has for forty years been the site of miracles, and miracles in this twentieth century have been hard to come by. Father Nasis, who never sought public acclaim and managed to remain his humble self throughout, was a priest of the Annunciation Church for more than thirty years, passing on in 1974. His many writings, and supplications in honor of St. Xenia give testimony to his faith. His discovery remains in his beloved church, and many a gaze will be fixed upon the sweet St. Xenia who was cloaked in anonymity for seventeen centuries, but whose memory will now be honored for as long as there is Greek Orthodoxy. From Orthodox Saints, v. 2, by Fr George Poulos, Holy Cross Orthodox Press.